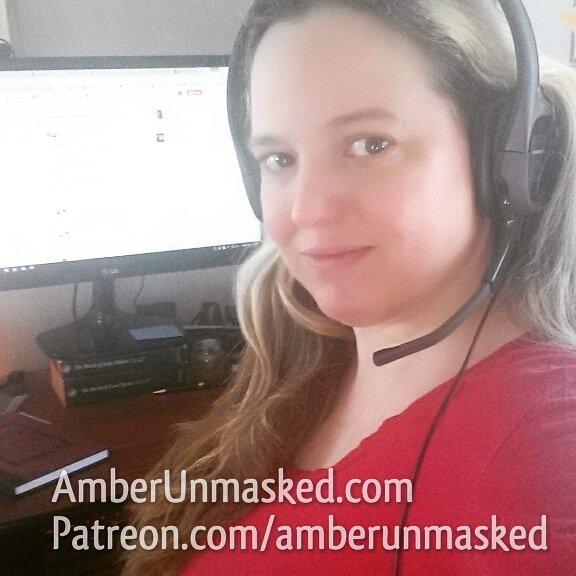 FEB, 2011 – For some reason, people have expressed interest in seeing AmberUnmasked t-shirts. I’m flattered and still baffled that someone would want to wear a shirt, button, or whatever with my name on it. I was definitely something that I wanted for myself to wear at booths and cons when not in a costume. When my friend and inker ANDREW HARMON sent me a few logos, all I really planned to do was upload them to cafepress so I could print my own shirts and coffee mugs for myself. See, I’m still finding it unbelievable that fans I’ve never met or even my friends that I love would order an AU stamped product. Well, we’ll just have to see how this goes! BUT WAIT, THERE’S MORE! Koni Waves creator and fellow Jersyan STEPHEN SISTILLI was equally as bored as Andrew and decided that he would come up with a banging headshot logo for me. He chose to stick with the basics that Andrew harnessed: the striped hair, the goggles and the color pink. I thought what Stephen did was perfect for buttons so I monkeyed with adding some text and hope the final result didn’t ruin Stephen’s image. As I said, I was just going to make one or two t-shirts, a coffee mug and a button, but cafepress makes bulk adding of products quite easy so there’s a wide array of swag uploaded already. If anyone has a special request, like you really feel the need for an AU mousepad, just let me know and I’ll activate the product. HAPPY SHOPPING AND MANY THANKS FOR YOUR SUPPORT! should also try http://www.zazzle.com ! they have a lot more products to offer!